When Did Owning a Dog Get So Expensive? If you’re anything like me (and I assume you are, otherwise you wouldn’t be on this site), you love dogs to distraction and can’t imagine your life without one. I had a brief dog-free period in my life (I talked a bit about it in 7 Rules for Apartment Dwelling Dog Owners), but it’s not something I really want to go back to. In fact, one of the happiest days of my life was when I looked at my bank balance and ascertained that I could finally afford a down payment on a little house, manage the mortgage payments, and yes, get a dog! Of course,the way it turned out, I’ve never had fewer than two dogs, but that’s definitely not any sort of complaint. So, why was I dog-free? Well, for one thing, my landlord wouldn’t allow dogs. For another, I wasn’t just on a tight budget – I was on a poverty budget. Over-educated, under-employed, stuck with a student loan that had to be repaid – you get the idea. In fact, there were times when I’d skip meals rather than subject myself to another bowl of ramen noodles. I was not in any position to have a dog and care for it properly, and if this sounds like your situation, then I’d strongly suggest that you wait until you’re better off before you even consider getting a dog. That’s not to say, though, that you can’t have a dog if things are a bit tight. In fact, owning a dog can go a long way to bringing happiness into a life that isn’t exactly filled with material things. Here’s the thing – sometimes owning a dog doesn’t have to be nearly as expensive as you think. When I was growing up, I can’t recall ever paying anyone for a dog. Any of the dogs we had were usually “free to a good home” out of a litter that some neighbor’s dog had, and the only real expenses were the shots and a collar. We didn’t even buy dog food – after all, that’s what table scraps were for! Now, I’m not suggesting that you should take it to this sort of extreme – or lack of extreme, if you like. We know a lot more now about how to properly care for dogs than we did when I was a kid, so a decent, well-balanced dog food is a must. That said, you don’t have to go nuts buying the “designer” brands. I think where many people make mistakes, though, when it comes to owning a dog without breaking the bank, is in thinking that a dog isn’t going to be happy if he doesn’t have special bowls for his food and water, booties and coats for the winter weather, regular visits to the groomer, doggie day care and all that other stuff. You know what your dog really needs to be happy? It’s pretty simple – your dog needs a roof over his head, enough to eat, exercise, proper veterinary care, and you. That’s basically it. What I’m trying to say is that there’s a happy medium between the way dogs were raised in my younger years, and the total overkill that many dog owners seem to be going for these days. So, if you’re on a tight budget, don’t think that it means you can’t have a dog. 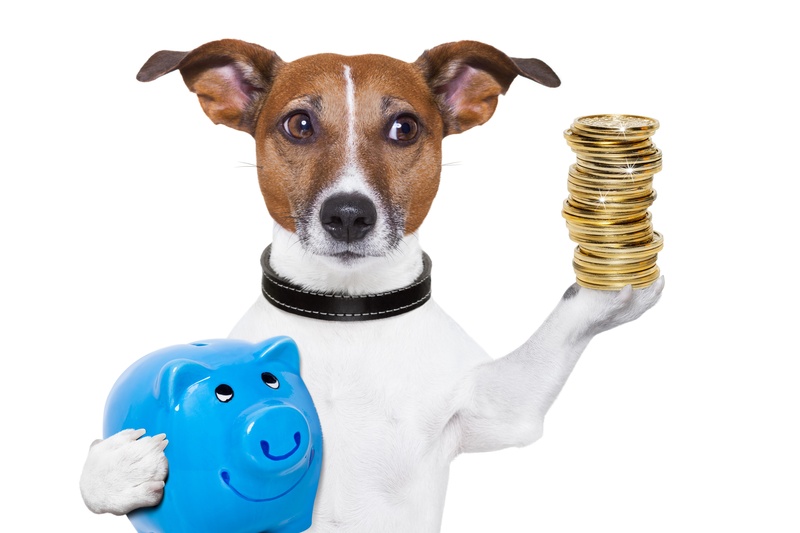 Much of the time, you can cut your costs simply by being a bit resourceful and devoting a fair bit of time to your dog’s care instead of simply throwing money around. The following are some suggestions that will help you to fit a dog into your household even if you’re not wallowing in cash. These are the dogs that you’ll get for nothing, or for a nominal adoption fee at a shelter. You’ll save money at the outset, and you’ll probably also save later on, as mutts are typically prone to far fewer of the health issues that can plague purebred dogs. Also, if you’re adopting from a shelter, find out what’s going to be included in the adoption fee. Some shelters include basic shots and neutering, while others do not. There are all kinds of adult dogs who need homes. Sure, they’re not quite as adorable as puppies, but puppies also come with additional costs. You’ll need to get a puppy its shots and have it spayed or neutered, and if you don’t know how to train a dog, you’ll also have to enroll your puppy in obedience classes. When you have your dog spayed or neutered, you reduce the risk of diseases like mammary cancer in females and testicular cancer in males. These diseases can be costly to treat. Also, the licensing fee for a spayed or neutered dog is usually cheaper than it is for one that’s intact. I’m not suggesting that you feed your dog a poor diet, or resort to table scraps. However, many dog food brands are ridiculously over-priced. My vet, Stephen, is of the belief that almost any dog food is just fine. In fact, if you check out the ingredient list on a bag of really pricey dog food, and compare it to the house brand, you’ll find little difference. Your dog doesn’t need expensive treats. I give Janice and Leroy the generic equivalent of Milkbones, and they’re always happy to get them. I think it has less to do with the quality of the treats than it does with the fact that I’m giving them something. After all, to dogs, food equals love. Of course, if you’re training, sometimes it’s useful to incorporate “high value” treats in with the usual offerings, but if it’s just, “Here, take this because I love you,” then the less expensive ones serve the purpose equally well. By this, I don’t mean that you shouldn’t have your dog vaccinated. Not only are regular vaccinations essential to your dog’s health, anyone who’s ever had to have a dog treated for parvo, heart worm, or any other totally preventable disease will tell you that the cure is considerably more costly than the prevention. However,the American Animal Hospital Association has new guidelines, and now recommends that the basic vaccines be given every three years, not every year. If you’re dealing with an older veterinarian, he or she may not be up to speed, so ask if they’re aware of the new guidelines, and find out what they recommend. Also, keep in mind that prices can vary a good deal from one veterinary clinic to the next. Of course you don’t want to compromise your dog’s health, but it doesn’t hurt to shop around. Dental care for dogs can be very costly. If your dog ends up needing a root canal, you can probably pretty much kiss any savings you have goodbye. So treat your dog’s teeth the way you do your own, with regular brushing. If you can afford them, professional cleanings from your veterinarian can also go a long way to preventing more serious dental issues later on. This is something you want to do early in your dog’s life, because the older the dog gets, the more expensive the insurance is going to be. Probably not much will go wrong health-wise in a young dog’s life, but there’s always the risk of something catastrophic happening – your dog could be hit by a car and require major surgery, for instance. Then, as your dog ages, health issues can begin to crop up, and if your dog ends up needing something like cancer treatment or a kidney transplant, if you’re not insured you’re going to need a second mortgage to cover the costs. Assuming, of course, that you don’t end up having to opt for euthanasia. With some pet insurance policies, though, the amount covered can drop as the pet ages. So make sure that you ask a lot of questions before buying a policy, and know exactly what’s covered. Pet insurance can be an invaluable resource if you get the right policy, or essentially useless if you get the wrong one. Read the fine print. Regular visits to a groomer can end up costing you a small fortune, and really, there’s nothing (outside of specialized clipping for show purposes) that a groomer can do for your dog that you can’t just as easily do at home. One thing that you’re going to have to do for your dog is clip his toenails regularly, unless he typically runs on hard surfaces that will wear the nails down. If you’re nervous about toenail clipping because you’re not sure how far to trim without hurting your dog, you could pay an initial visit to a groomer to learn how to get the job done. Or, when you take your puppy to the vet for his shots, you could ask your vet to show you the right way, and it won’t cost you any extra. You can also check out online videos that will show you the proper way to clip your dog’s nails. Your dog’s ears also need to be cleaned regularly, and you could go broke buying expensive ear wash. On the other hand, you could make your own. I use a simple mix of one part white vinegar to two parts water for Janice and Leroy. It gets the job done, and costs pennies. Now, when it comes to bathing, I do think that you should use a decent dog shampoo, simply because most human preparations (even the ones for babies) are too harsh for your dog’s skin. Don’t waste your hard-earned money on post-bath doggie perfumes, though. The whole purpose of perfume is to prevent your dog from rolling in something horrible after his bath. Dogs love strong odors, and whether they’re pleasant or nasty doesn’t much matter to the dog. Here’s a secret, though – a bit of your own favorite perfume will do the job just as well as the pricey doggie stuff, and you’ll have to use less of it to get the desired effect. I do recommend obedience classes, simply because they’re very effective. But you can also go it on your own if you like. Watch an online video, get a book or partner up with a friend who knows how to train, and get going. It’s actually not all that different for dog parents. Of course, you shouldn’t let your dog play with ribbons, because they can cause harm to the intestinal tract if eaten. But I’ve seen Janice and Leroy, so many times, having a total blast with nothing more than a shoebox or a paper bag. Sometimes, the best toys are the ones that cost you little or nothing. This kind of goes with the same caveat that I offered up regarding vaccinations – don’t shortchange your dog, but also don’t assume that you have to pay an arm and a leg. Often, the medications that you get from your vet are the same ones that you can get at a “human” pharmacy at considerably less cost. A great relationship with your vet goes a long way in this regard – Stephen often tells me that he could give me medication from the clinic, or I could just get it OTC at the Walmart pharmacy at about a third of the cost. This is something that no dog owner really wants to think about, but it has to be said. There is a cost involved in euthanasia, and then you have to think about how you will lay your dog to rest. If you choose cremation, the cost will relate directly to the weight of your dog. An English Mastiff, for instance, is considerably more expensive to cremate than a Shih-Tzu. If you go with cremation, will you want an urn? That’s another cost. If you choose burial, can you dig the grave yourself, or will you need to have someone come in with a backhoe to get the job done? From the day that you bring your dog home, you should have an end-of-life plan in place, and begin saving for it. Your savings plan could be something as simple as not spending change. I’ve been doing this for years, using bills for everything I buy using cash and then tossing the change into a jar at the end of the day. Last year, I saved over $500. It takes no time at all to save up for those sad final days this way. Now that you’ve seen the many ways that you can have a dog without destroying your budget, the rest should be easy. Find a dog. Love him. Care for him properly, but don’t feel that you have to practically bankrupt yourself doing it. Your dog will bring you joy every day, and that’s a pretty darn decent return on what doesn’t have to be a huge investment.